Despite showing a zinc on their website there is NO provision to fit one to your new propeller. Note: I have no affiliation with GORI beyond being a a satisfied and happy customer. After an exhaustive study of the available folding propellers to compliment the repower of my Atlantic 42 sailing catamaran fitted with brand new Yanmar 3ym30 diesels driving Yanmar SD saildrives, I initially selected Flex-o-Fold. No one could have know what a mistake this would turn out to be. My complaint is simple. Flex-o-Fold marketed and sold one product, yet knowingly shipped a inferior and potentially damaging product. Namely Flex-o-Fold does not sell the products pictured on their website. 2012 UPDATE: Nearly 2 years later the Flex-oFold website still markets a product they do not produce. Read on the for the details. I opened the box, but was immediately disappointed to find that the propellers in the box differed from that advertised on the website. The propellers had NO provision to fit a zinc anode... that little $5 part that protects against corrosion between those very expensive dissimilar metals sitting in seawater (props and saildrives). Flex-o-Fold apparently decided to make a penny wise, pound foolish decision and eliminate the zinc anodes. Not only that, but they also eliminated the provision for customers to fit zinc anodes themselves. Sure they saved the pennies on manufacturing, but at the long term cost of thousands of dollar in potential damages to customers' boats in the long term. from the costly damages of corrosive forces at work between dissimilar metals and seawater. I contacted Flex-o-Fold to point out the missing provision for a zinc anode. It took several days for Flex-o-Fold to get back to me. "There were only a very limited number of 2-blade saildrive hubs manufactured with the anodes on the side of the hub. This was at Yanmar’s insistence... you did receive the correct 2-blade saildrive hubs." Flex-o-False: I did not receive the correct hubs: I received hubs without a provision for fitting zinc anodes and the Flex-o-Fold propellers I ordered off the website clearly showed zincs. 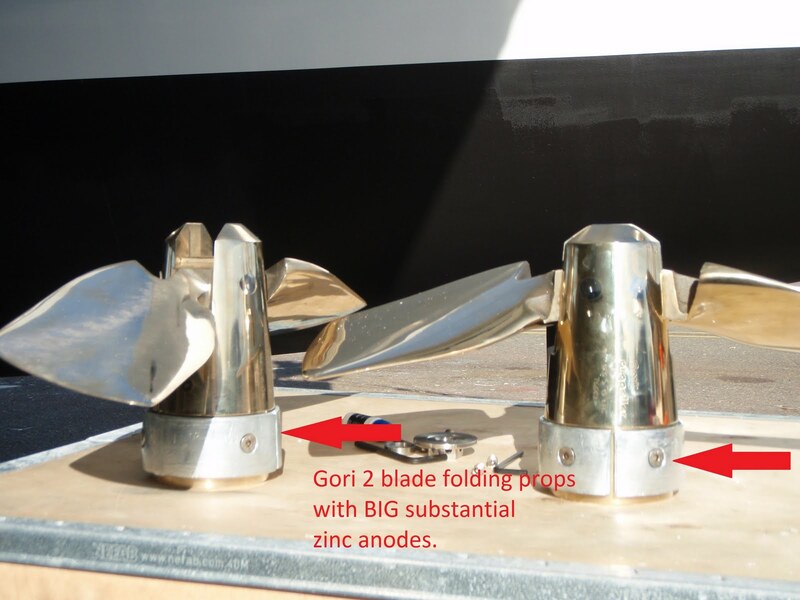 Flex-o-False: I communicated on two occasions that the propellers were intended for Yanamar saildrives, yet Flex-o-Fold shipped hubs with out a provision for a zinc anode as required by Yanmar. How could this be possible that Flex-o-Fold intentionality markets one product yet cheat their customers by deliberately distributing an entirely inferior product to their customers? Case in point: On the Flex-o-Fold website the standard 2 blade folding propeller is shown in over eight (8) photographs with the zinc anode. ( 2012 update: Still pictured with zincs, do they offer these now or are they still misleading customers) The propeller is shown exactly zero (0) times without the zinc anode. Flex-o-Fold makes no mention of specifications changes. There is not any disclaimer on the website that specifications are subject to change. Nor did Flex-o-Fold communicate the change at the time during the sales process. Disappointed, I followed up with an email to Dan Tucker requesting that Flex-o-Fold send me the product they are marketing on their website or refund my purchase. As was becoming the norm, Flex-o-Fold was not timely in a response. After sleeping on the issue several nights waiting for a response. I called Dan Tucker of Flex-o-Fold to problem solve the issue on the phone. Deliberate deception? Dan Tuker the Flex-o-Fold distributor for the USA told me that "Flex-o-Fold had not manufactured propellers with a provision for zinc anodes in over a year" . And yes, he knew the website was wrong, but had made no effort to modify it during the many months the new website had been live. I asked him if I could quote him on the phone so this is a direct quote. Knowingly deceiving customers through deceptive false advertising and making no apologies? This call was getting worse by the second and I had no desire to do any further business with Flex-o-Fold. I returning the Flex-o-Fold propellers and asked to be refunded my initial payment as well as shipping costs. It was a huge fight to get Dan to agree to cover shipping costs and I doubt he'll follow through (see follow up below: Dan Tucker of Flex-Fold disappoints again). So I sent the propellers back to Flex-o-Fold the next day. Luckily, I decided to pay extra for a Confirmation Receipt. So, the propellers were delivered withing three days per confirmation delivery via USPS. After about a week I called Flex-o-Fold's Dan Tucker to remind him to refund my purchase price and guess what he claimed he had not received the propellers despite the delivery confirmation from the USPS. So, I waited another week and guess what Dan still claimed he had not received the propellers and WOULD NOT refund my purchase price. So, being VERY disappointed with Flex-o-Fold and especially Dan Tucker I sent him an email outlining my dissatisfaction and intent to contact Flex-o-Fold corporate with my complaints. Amazingly, Dan found my propellers within about 15 minutes and then told me he would get me my refund in three days. So, it was only about 18 days after I returned the propellers that Dan Tucker and Flex-o-Fold again disappointed me by not refunding the shipping cost as Dan Tucker and Flex-o-Fold had agreed. To top it off Dan Tucker and Flex-O-Fold DID NOT refund my purchase price to my credit card, but instead sent me a check. Thank goodness the check didn't bounce and I was only out the shipping cost and the hassle of dealing with a unscrupulous representative (Dan Tucker) of Flex-o-Fold. Remember the old saying Caveat emptor (i.e.Buyer beware) well consider yourself well advised is you are thinking of doing business with Flex-o-Fold. My new Gori propellers are awesome. 2012 Update: With over 1200 hours on the engines including a trip to Alaska the Gori pros still look new... even after chopping up some glacial ice. Go with Gori and you'll get a superior product, responsive and knowledgeable sales staff and the confidence of a solid well respected long term company that doesn't have 'Fold' in the name as those sorts of companies usually don't stick around very long. I have no affiliation with GORI beyond being a a satisfied and happy customer.